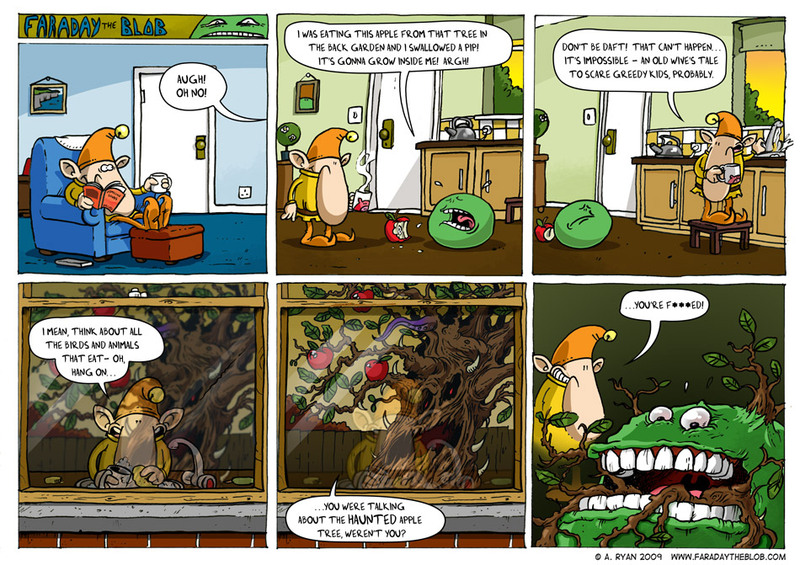 This entry was posted on Friday, August 14th, 2009 at 7:00 am and is filed under Comics. You can follow any responses to this entry through the RSS 2.0 feed. You can skip to the end and leave a response. Pinging is currently not allowed. Wow, poor Faraday! Nice comic. Cheers Tony! Yeah, poor Faraday, he’ll probably be ok though – a pint of Roundup will probably clear it up! Bloomin haunted pips! Who says eating apples are good for your health?! Aoife – haunted apples are more delicious! cooool!!! wow the reflection in the window is awesome!! !